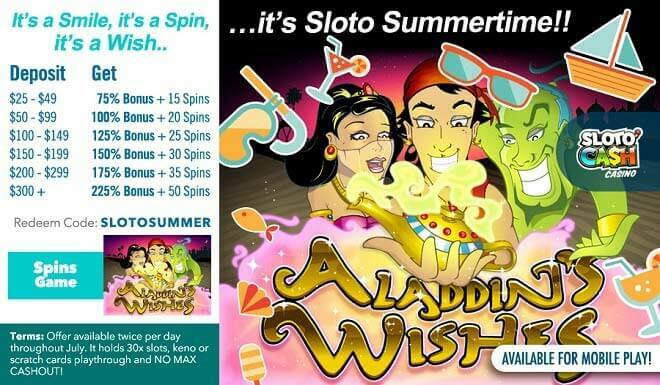 There’s a lot of magic happening in Mr. Sloto’s realm this summertime – and you can join in when depositing as little as $25 to play with up to a 225% Match + 50 Aladdin’s Wishes Spins! Make the most of the magical summer month of July! We will kick off the season with Mr. Sloto’s best magic trick of the year: a huge bonus and tons of Free Spins! Play one of our most popular slots and get ready to welcome the sunniest days of the year with wins! Winning will definitely be the magic word for this kickoff of a new season with Mr. Sloto’s summertime winning chances! Offer available twice per day throughout July. It holds 30x slots, keno or scratch cards playthrough and NO MAX CASHOUT!